There are some fantastic independent bottlers currently operating and not just confined to the UK. One I've been meaning to check out for ages is the German bottler Malts of Scotland (MOS) that has been picking up a slew of awards for several years now. I couldn't overlook a bottle that turned up at auction earlier this year just to see what all the fuss was about. The cask should be the main ingredient but MOS also combine this with a distinctive design ethic that proclaims literally every bottle is a benchmark. The information is clear, concise and does the trick. The bottle shape itself continues the originality theme and suggests that every aspect has been considered. The story behind this endeavour is just as efficient having spent several years acquiring casks from distilleries before their first bottling. Enough of the visual merchandising design lecture. 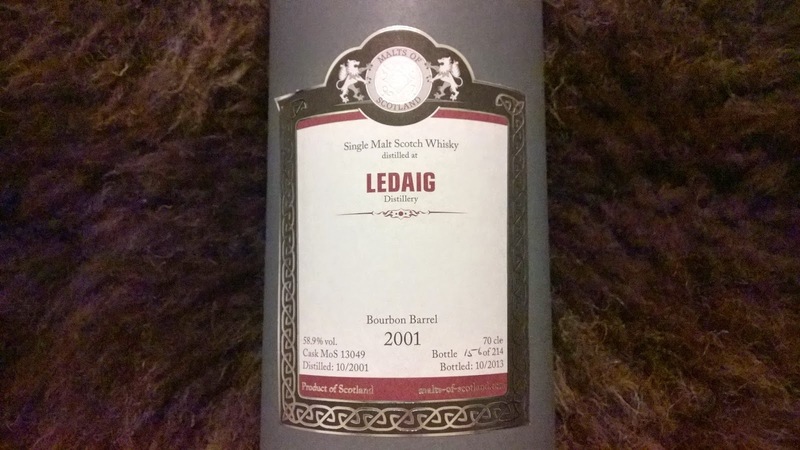 We're back on Mull after reviewing the staple official 10 year old release from Ledaig recently, now we're going slightly older with this cask strength sibling from a bourbon cask. I'm expecting a lot more oomph here so lets see. Nose: the freshness of pine cones, honey, a newly opened vanilla pod, citrus sweetness of oranges, a gentle waft of smoke and an oily note reminiscent of sunflower oil. A playful nose with marzipan and a coastal saltiness. Taste: an ashy/earthy quality that transforms into roasted coffee, those dark flavours continue with liquorice and bitter dark chocolate. Adding water doesn't really benefit the dram much here just removing the characteristics leaving the peated edge. 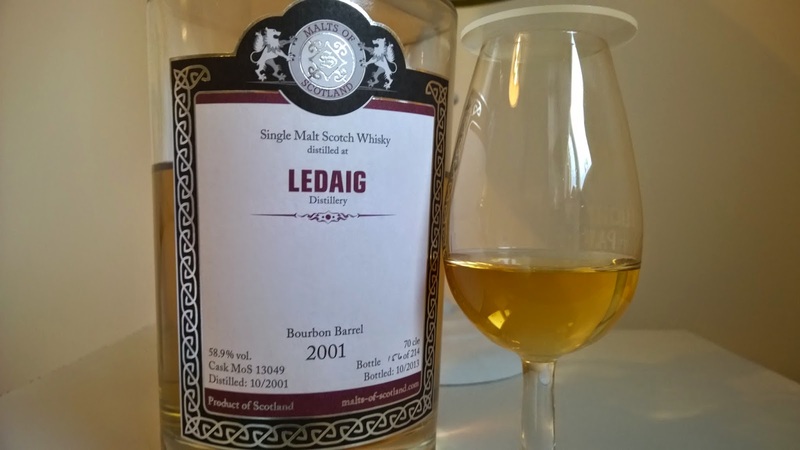 Surprisingly drinkable at cask strength, I'm enjoying this Ledaig more than the official 10 year old. A playful and enjoyable release, perfect for a cold winter evening. Initially rough around the edges, you'll soon appreciate its rugged character.